New Arrival!! Hard To Find This Nice. Ready for The Trails. One-Owner, Clean CARFAX. Navigation, Heated Steering Wheel, Remote Start, Panoramic Sunroof, Rear Back-up Camera, Leather Interior, Bluetooth Hands Free, 4X4, Lane Departure Warning, Tow Package, Adaptive Cruise Control, AdvanceTrac With RSC, Perimeter Alarm, Heated and Cooled Seats, Second Row Heated Seats, EcoBoost 3.5L V6 GTDi DOHC 24V Twin Turbocharged, 10-Way Power Driver & Passenger Seats, 360 Degree Camera, 4.10 Front Axle w/Torsen Differential, Adaptive Cruise Control w/Collision Mitigation, Advanced Security Pack, Ambient Lighting, Auto High Beam, BLIS Blind Spot Information System, Dual-Zone Electronic Automatic Temperature Control, Electronic Locking w/4.10 Axle Ratio, Equipment Group 802A Luxury, Exterior Graphics Package, Heated/Cooled Leather 40/Console/40 Front Seats, Inflatable Rear Safety Belts, Integrated Trailer Brake Controller, Intelligent Access w/Push-Button Start, Lane-Keeping System, LED Box Lighting, LED Side-Mirror Spotlights, Memory System (Seat, Pedal, Exterior Mirror), Power Glass Heated Sideview Mirrors, Power Tilt/Telescoping Steering Column w/Memory, Power-Adjustable Pedals, Power-Sliding Rear Window, Pro Trailer Backup Assist, Radio: Sony Single CD w/HD & SiriusXM Satellite, Raptor Technology Package, Remote Start System w/Remote Tailgate Release, SYNC 3, SYNC Connect, Universal Garage Door Opener, Voice-Activated Navigation. 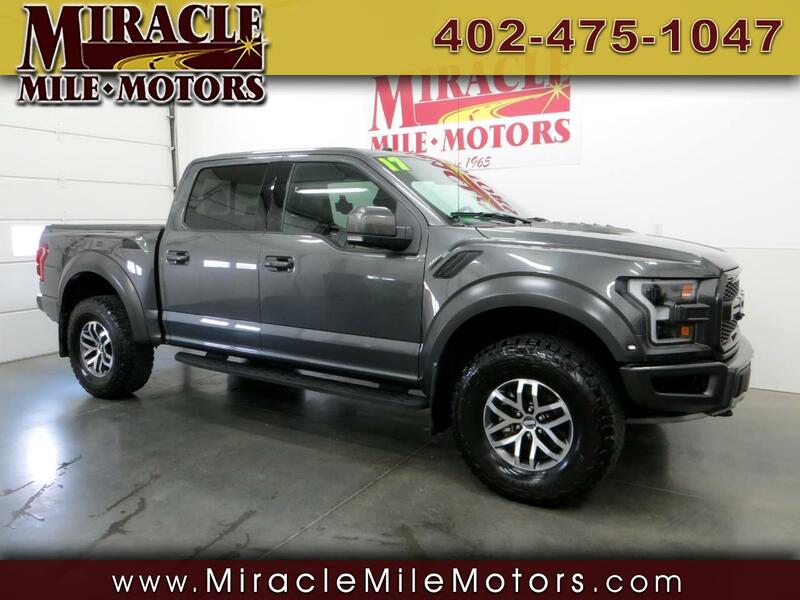 2017 Ford F-150 Raptor 4D SuperCrew 10-Speed Automatic 4WD EcoBoost 3.5L V6 GTDi DOHC 24V Twin Turbocharged Miracle Mile Motors in Lincoln NE have been in business for over 50 years selling premium quality used cars, trucks and SUV's vehicles. We are committed to save you time and money and make your buying experience hassle free and pleasurable. All of our prices are clearly displayed on each vehicle. We offer bank financing , service contracts, and Carfax reports. NO DOCUMENTATION OR HIDDENS FEES. Word of mouth is our best advertising. Please look thru our inventory at www.miraclemilemotors.com or e-mail with any questions. 1-888-465-8963 87th & Hwy 2 Lincoln, NE 68526 Where Friends Tell their Friends to Buy CarS.